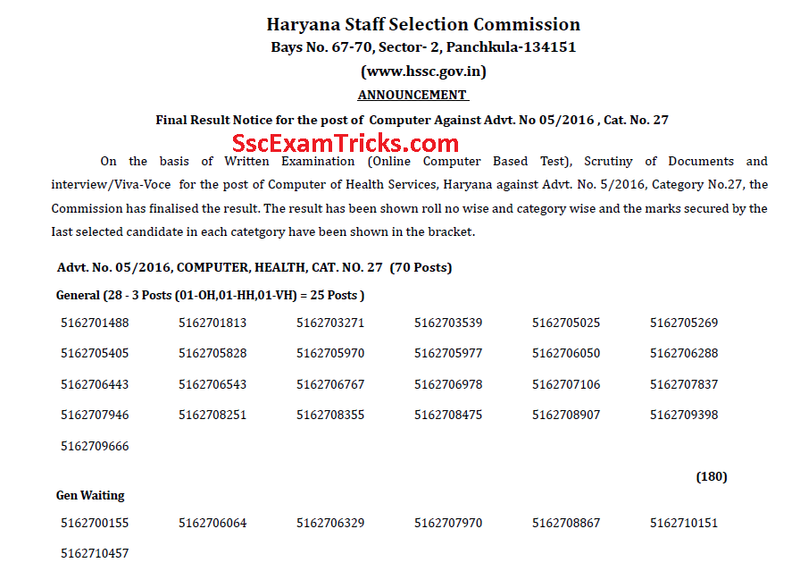 HSSC Female Supervisor Final Result 2018 Advt. No. 7/2016 Final Selection List Scorecard/ Marks , HSSC Answer Keys 2017 for Municipal Secretary & Assistant Sanitary Inspector - HSSC Water Pump Operator Final Result 2017-18 - HSSC Assistant Secretary (HSAMB ) Admit Card 2017 Exam Date Announced - HSSC Advt. 7/2016 Hall Ticket - www.hssc.gov.in. The good news is that HSSC has uploaded Admit Card for Labour Inspector Examination which has been scheduled to be held on 31st August 2017. The candidates must login their account to download online admit card. It is advised to the candidates to print all three pages. The first page of admit card will be for Official use and will be submitted at the time of examination. The second page of admit card will contain instructions which must be followed in the exam. The last and final page of admit card will be the admit card for the candidates which will be given to the candidates by the officials after verification after the examination. The direct link is provided here to download online call letter. The exam pattern and syllabus are discussed below. The good news is that Haryana Staff Selection Board has uploaded the exam date notice for labour inspector on official website. The written test will be organized on 31st August 2017 at Panchkula. The online admit card will be uploaded on 24th August 2017 at www.hssc.gov.in. The good news is that HSSC has declared the final result of Water Pump Operator Grade-II of Public Health Department, Haryana, Against Advt. No. 07/2016, Category No.30 based on written test, Scrutiny of Documents and interview/Viva-Voce of the eligible candidates on various date of previous months. NOTICE TO THE CANDIDATES FOR CANCELLATION OF WRITTEN EXAMINATION( Computer Based Test) DATED 28.L2.2,O17 for the posts of Junior Engineer (Civil), Advt. No. 7/2OL7, Cat. No. 28 POSTPONEMENT OF WRITTEN EXAMINATION (COMPUTER BASED TEST FOR VARIOUS posts No.7/2015 Cat. No. 18, ADVT. No. 11/2015 Cart. No. 10 & ADVT. No.7l2OL7 Cat. No.30 RESPECTIVELY. Further the examinations to be held on 29.72.2017, 30.12.2OI7 and 31.12.2017 for the post of Accountant (MC) Advt. no. 712015 cat no 18 for agriculture Marketing Board Panchkula Haryana, Junior Engineer Advt.no II|2O15 Cat. No. 10 for town & Country Planning Department Haryana and Junior Engineer (Electrical) Advt. No. 7/2OI7 Cat, No. 30 for Haryana Urban Development Authority (HUDA) Panchkula respectively are hereby Postponed till further orders due, to technical & administrative reasons. The exam to be held on 01.01.2018 & 01.01.2018 will be remained same. The exam date has been announced for draftsman. 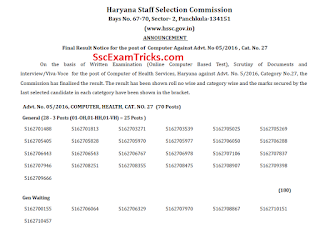 The breaking news is that HSSC has uploaded the final result of computer (Health Service) under Advt. No. 5/2016 Category number 27 on official website www.hssc.gov.in. The roll number wise list of eligible candidates called for interview has been available now. The appointment letter may be available in November/ December 2017. The final result / merit list has been prepared out of 225 marks in which 200 marks for written test and 25 marks for interview are taken into consideration for preparing it. The news is that HSSC has uploaded answer keys for the posts of Labour Inspector on official website. from 31.10.2017 to 03.11.2017 up to 5.00pm on email ID: hsscsecyobjection@gmail.com. 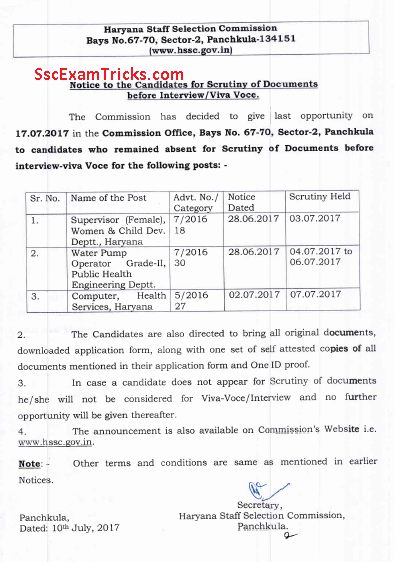 In this notice, the absentee can attend the document verification before interview/ viva-voce on 10th November 2017 at Field Hostel, Haryana Urban Development Authority HUDA (Adjoining Laxmi Narayana Mandir), Sector-6 Panchkula. The candidates are required to bring all original documents as mentioned in the application form & photo ID proof. 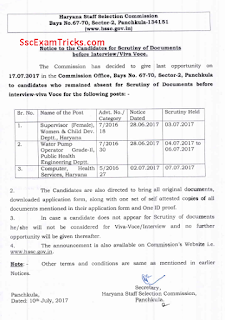 The good news is that HSSC Water Pump Operator & Computer Interview Schedule 2017 has been uploaded on www.hssc.gov.in. The interview has been scheduled on 02nd November 2017. The interview call letter can be download from now on official website. The written exam will be objective type MCQ based question paper in which four alternative questions will be asked from general awareness, numerical ability, reasoning and English language. The exam date will be intimated very soon on the official website. The news can be read through the image given below. It is assumed that the written test will be organized within 90-120 days after the last date of online application form or the exam will be held in May/June 2017. HSSC will upload Clerk Operator. Notice to absentee candidates for Interview of Water Pump Operator Grade II, Supervisor ( Female) & Computer under Advt. 7/2015 and 5/2016 Category no 18, 30 & 27. The interview call letter can be downloaded from official website www.hssc.gov.in. The final merit list will be prepared out of 225 marks. The interview will be organized for those candidates who gets qualified in the written test. The date of interview will be intimated after the result of exam. · Original proof of fee deposited by treasury challan/credit certificate. 5 Junior Engineer (Horticulture) (Re-Advertised). 29 Junior Engineer (Hort.) (Re-Advertised).